I haven't posted for a few days because we have friends staying over. They are still here so I am quite busy, but I have managed to post this quick project. This project was for my small ironing board. The cover had been completely worn and was past the point or being repaired. I already had some material in mind, which was from the remnants of an old quilt cover. I had some wadding going spare so used that under the cover. This task was fairly quick and didn’t cost me anything. The photo above shows the basics needed (board, wadding, material), also needed were: elastic, and thread. 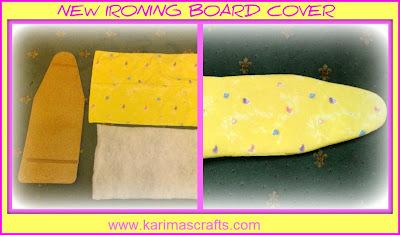 I placed the ironing board onto the material and traced the shape of the ironing board. I then gave enough space for hems (including an elastic casing space). This was a fairly simple task and didn’t take too long.